Founder and Executive Chairman of Knighthood Capital, James Hogan, served as President and CEO of Etihad Aviation Group until 2017. At Etihad he built an enterprise with a $20billion turnover, building a world class aviation and travel group. Under his leadership, Etihad was named Air Transport World’s Airline of the Year 2016. Hogan had begun his career in 1975 at Ansett as a check-in assistant and ultimately rose to hold senior positions with British Midland, Forte, Gulf Air and Hertz. In recent years he also held positions as Vice Chairman and as a board member of airlines Alitalia, Air Berlin, Air Serbia and Jet Airways. He was Vice Chairman of the Executive Committee of the World Travel and Tourism Council, and has served as a member of the IATA Board of Governors. CEO Middle East Magazine named James Hogan as Aviation CEO of the Year 2008 and Visionary of the Year in 2010. He has also served as a member of the UBS Industrialisation Advisory Board. He is a Fellow of the Royal Aerospace Society. 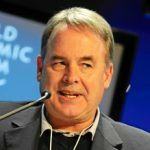 In 2017, in the Queens’ Birthday Honours List he was appointed an Officer of the Order of Australia for ‘distinguished services to the aviation transport industry, to the development of tourism and trade linkages between Australia and the Gulf states, and to international airline associations’.